1What are Wine Cellar Refrigeration Units? 2How do Wine Cellar Cooling Units Function? Wine enthusiasts in California know that wine can only be stored in select places, like a residential custom wine cellar, a wine cabinet, or a wine cooler. Among the different types of wine storage solutions, custom wine cellars are the most effective and enjoyable form of wine storage for your home, adding beauty and functionality to your residence. They are able to provide the ideal conditions for wine storage, when they are built with the right insulation, vapor barriers, and above all–a wine cellar refrigeration unit. What are Wine Cellar Refrigeration Units? Residential wine cellar refrigeration units are like air conditioners, but are specifically designed and constructed to provide the exact temperature and humidity that wines need for storage. Air conditioners cannot meet wine storage requirements, which are necessary to protect your wine collection. Generally, wine cooling systems not only cool wine cellars, but also monitor and regulate the temperature, to ensure proper wine storage. How do Wine Cellar Cooling Units Function? Wine cellar cooling systems are basically air exchanger units. This means that they provide cool air to the home custom wine cellar, while removing hot air by venting it to an exhaust room. Although there are different brands of wine cellar cooling systems, all manufacturers aim to make units that fulfill their task, in order to constantly keep the temperature and humidity in the ideal levels. When selecting a cellar refrigeration unit, it is important to consider the size of your wine storage room. If a small wine cellar cooling unit is installed in a huge wine room, the wine cellar will not be able to provide the necessary temperature and humidity, and will also be overworked and consequently damaged. If the wine room cooling unit is too big for the wine cellar, on the other hand, you will unnecessarily spend more than you should. When purchasing a wine room refrigeration unit, do not buy based on brand or price. Instead, check the unit’s specification, and look for features that will provide the more efficient performance and convenience. A unit that has longer life expectancy is always better. Check the unit’s warranty. Generally, manufacturers provide longer product warranties for wine cellar cooling units that expected to last longer. Moreover, the more expensive options are usually the more durable ones. Before purchasing a custom wine cellar refrigeration system, review the manufacturer’s specification for highest efficiency with the leas power consumption. A lot of energy efficient products are expensive at purchase, but will help you save more in the long run. Although many of the more expensive wine cellar refrigeration units in Orange County, California are better types of units, it is important to consider your budget. Establish your budget, and search for the best deal, that gets you the necessary conveniences. When choosing a home wine cellar refrigeration unit, check its installation requirements. Some refrigeration units have do-it-yourself installation procedures, while others require a licensed HVAC technician. Some wine cellar cooling units are noisy, while others are not. A unit that is not noisy is recommended for residential wine cellars. The home wine cellar cooling unit you choose should have good product warranty. Most custom wine cellar cooling systems in Orange County, California have a 3 to 5 year warranty on parts and labor. There are three basic types of wine cellar refrigeration systems in Orange County, California. 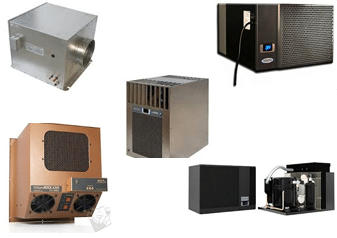 These cooling systems come in various sizes, shapes and specifications. Through-the-wall wine cellar cooling units are self-contained wine cellar cooling units. They are the least expensive types of cooling units, and are ideal for small wine storage rooms. These units are simply mounted on the cellar wall, or in between the wall studs. It is imperative that installation instructions are followed carefully, to ensure the proper wall placement and support of the unit. Through-the-wall cooling systems cool the wine cellar, and release the exhaust into an adjacent room. Generally, the adjacent room is air conditioned to dissipate the heat from the exhaust. Ducted cooling systems are very flexible in their installation and design. You can opt to have them placed through the wine cellar wall, or installed remotely and be ducted into and out of the custom wine storage room and the room that it’s placed in. Ducted wine cellar refrigeration systems operate quietly, and they are great for small cellars because they do not take a lot of space. 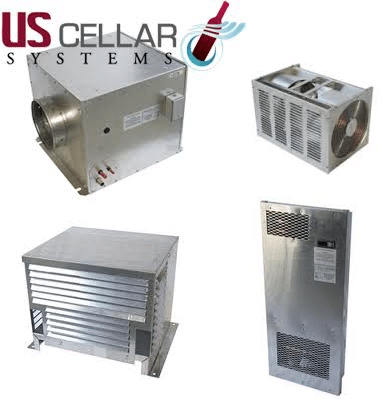 Ducted wine cellar cooing units need to be installed by HVAC technicians. 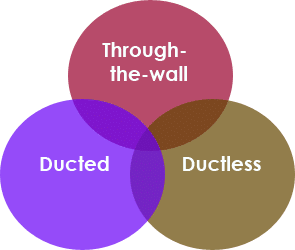 Ductless split and ducted split wine cellar cooling systems are very similar units. The difference between these two wine cellar refrigeration systems is that with ductless split wine cellar cooling systems, the evaporator coil is in the wine room with the split refrigeration unit, while the condenser is placed in an adjacent room, or outside the house. This type of wine storage room cooling system needs a drain for the excess condensation. A licensed HVAC technician is required to install this type of refrigeration system. There are various kinds of wine cellar refrigeration units in Orange County, CA. A few of the most popular brands include WhisperKool, CellarPro, CellarCool, Wine Guardian, Breezaire, KoolSpace, and US Cellar Systems. Regardless of what you choose, it is imperative that you pick one that can effectively provide your wine cellar with a temperature of 55 degrees Fahrenheit and a relative humidity of 75%, so that your wines can mature properly.